Google has chosen the top 10 best apps according to user experience in 2012. First on the list is Evernote, followed by Pinterest, and then Grimm’s Snow White. But if we focus on 9th place, we find Pixlr Express – a free, convenient app for taking photos and adding effects. There are tons of photo retouching apps on Android, including PicsArt, Lithic, Photoviva, or one of the best, Camera ZOOM FX. The competition is tremendous in this sector, and that’s not counting what recently happened with Twitter, which just a few weeks ago released an update for its iOS and Android apps that includes its own Instagram-like filters, although the features are much more limited. Pixlr Express for Android comes with more than 600 effects, filters, and borders for the pictures you take either from within the app itself or selected from your gallery. There are many features, all divided into different categories: various adjustments, such as color, brightness, and contrast, as well as layers, masks, borders, and filters. It also includes many automated features, such as the ability to autofix a picture with just one click, red eye reduction, temperature adjustment, and blurring effects. Also, each feature allows you to preview on your phone in real time what it would look like. If you don’t like how it looks, you can easily try out another one. 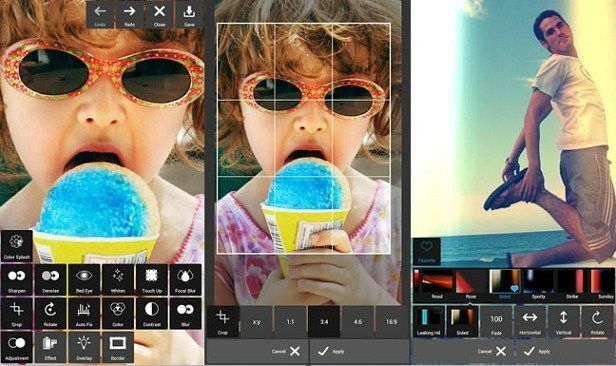 Pixlr Express is a fast, easy-to-use application with an enormous amount of effects, making it an indispensable app for Android. It is also compatible with older versions of the operating system. What’s more, you can also access Pixlr’s website, which works as a web app for photo editing, allowing you to edit and add filters to your photos conveniently from your mobile device. Pixlr.com’s online photo editor offers a series of utilities that are very similar to features offered by high-end computer programs such as Photoshop.